Been a long time since I posted. But saw this video linked on imgur to a low views video on youtube. So not sure if this has made the rounds at all yet. Seemed worth posting to get people's thoughts on. The way I understood it is that constrictors generally do not get big enough to fully consume an adult human due to the width of human shoulders. That a child is a possibility and does occasionally happen. But that a fully grown adult was at least highly unlikely. Maybe I don't understand the subject well enough (that's actually highly likely). But I've looked it up before and have only ever found bad still images or terrible video with little to no background information. Likely all of the evidence of this happening that I've personally seen could easily be hoaxes/mis-identification. This is the first thing I've seen that's actually compelling. As mentioned in the title this is graphic. It's a deceased woman (Wa Tiba age 54. Resident of Lawela Village, Lohia Sub-district, Muna District, Southeast Sulawesi). 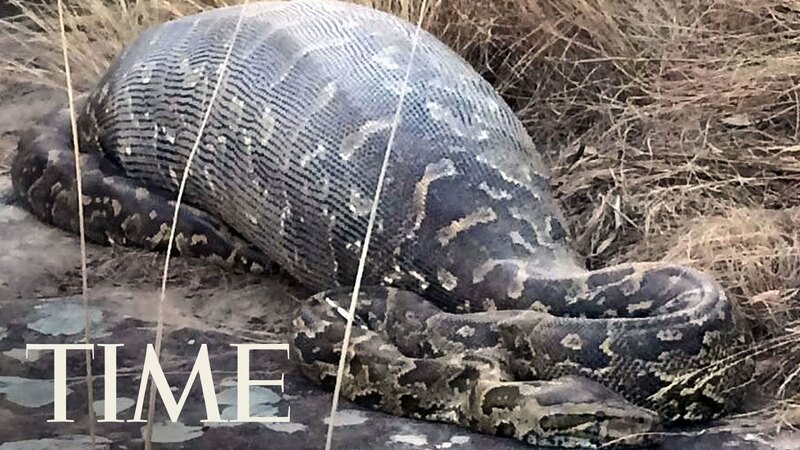 Being cut free from the belly of the Python that supposedly killed and devoured her. Well I think one thing worth noting is that these people are Indonesian. According to wiki the average male height in Indonesia is 5'2 and for females it's 4'10. That only gives us a rough idea though. Indonesia spans a large area and like with any place there are a lot of ethnic groups. But if we make the reasonable assumption that these people are not very far off from the average for their area of the world. Then they are fairly small as people go. Devouring your average Western man might be out of the question. But these people would seem to be about the size of one of our teenagers. Which is still fairly large. Still it I'm thinking it must have been an absolute Goliath of a snake. But it does seem to pull it more into the realm of plausibility. I’ve seen many hoaxes but this one looks authentic. If you ever travel to SE Asia you’ll appreciate that the average sizes and statures of these good folks are dramatically different than European and northern Asian decedents. craigb wrote: I have to agree. Prior stories lacked credibility. This made the rounds yesterday and was picked up by several news agencies. It appears to be the most authentic evidence I have seen. I would like to hear others on this forum with more experience weigh in. Ive had snakes try to eat me but none of them succeeded. This one looks like a success. Whilst it lasted. Fake. What a coincidence. Last year a nearly Identical vid. made the news rounds. That one also involved a 23ft python. That time it was a 25yr old man eaten. Video technology and the ability to create extremely realistic fakes is now available to anyone. For starters I've had numerus discussions with the guys that own snake skin business's in Indo. If you want to learn about pythons... abundance, sizes etc. these guys know more then anyone. They aren't finding 23ft snakes. But yet one after another pops up in these village's. Consuming people no less ! Secondly there is the anatomical mechanic's involved. A 75 lb pig folds into a neat cylindrical shape about 6" between the shoulders, swallowing even a very small person would prove to be a nearly if not entirely impossible task for a giant snake due the difficulty in first negotiating the rounded head and then having to make a monumental readjustment to clear the shoulders . In a previous thread I posted a pic. of a New Guinea tribesman aprox. 4ft. 8" holding a truly gigantic reticulated python that thoroughly illustrated this point. It never fails as fast as these click bait story's appear they disappear with out a shred of supporting evidence. Fake. A good rule of thumb. If it comes out of Indo, its a lie. So the pic of the small yet broad shouldered tribesman holding the gigantic python is clear proof that a human can never be taken. Ok thats cool. We get this is what you think. No need to re explain. I get what your saying I think most do, and most pay no mind to length quotes, its the curious iconry that is dramatic but also just interesting. There are many factors in all encounters and I have always thought a version of anti-worm (neuroethology toad study) ie; anti-prey shape and perspective in a snake's risk and recognition tendencies have something to do with the scarcity of data or actual human as prey events but I still think its possible, thats all. Bryan, Headland and Greene's paper ( http://www.pnas.org/content/108/52/E1470 ) is fascinating. Maybe I missed it in the paper, but they couldn’t address a member of the Agta folks just vanishing. It seems probable that when a community member just disappears, it may well have been a predation incident. It’s probable that the video is a well done fake, with modern video manipulation capabilities, but it also doesn’t change the feasibility that at least sometimes these people of small stature and hunter-gatherer life style become McNuggets to a large retic. The conical shape of a deer, a pig, or a rat is true, and the shoulders of a western person would probably be a swallowing barrier, but probably not so much for a southeast Asian woman or child. ..................................................................and found the body, which Ayogyog helped bury. Another when a young Large-spotted Cat Snake (Boiga multomaculata) with a pencil thin head, neck and body ate a lizard ( Acanthosaura capra ) with a head (with almost no tapering) that was easily 5 or 6 times the diameter of the snake. In reading some of my own conversation about this topic, it almost sounds like I want pythons to eat people more. Here is the incident from last year. Other than also being filmed with a cell phone and involving someone getting cut out of a python, I don't see how they're "nearly identical", or what the coincidence is at all. It's difficult to evaluate the legitimacy of an incident solely by watching the video because obviously none of us has seen a human get cut out of a python before. But everything about the body language, crowds, dialogue, filming method, etc. rings true to me. These don't look like actors doing a scene in either case. And both cases have been checked out by journalists who spoke to village leaders about the incident. So what's the conspiracy? It reminds me of the increased incidents of alligator attacks and cougar attacks, both things that I thought virtually never happened as I was growing up but seem to be happening more and more now. The more comfortable people get encroaching on habitat, along with the ubitquity of cell phones and global coverage of news, means we'll hear more of this than before. Since the ability to create such "realistic fakes" is available to anyone, I encourage the naysayers here to prove it with their own similarly realistic fake. Here's a more telling view of the same pic. Even with the forced perspective (the head out in front of the mans body).It is painfully obvious that it would be impossible for the snake to articulate it jaws past the wide shoulders once passing the head. 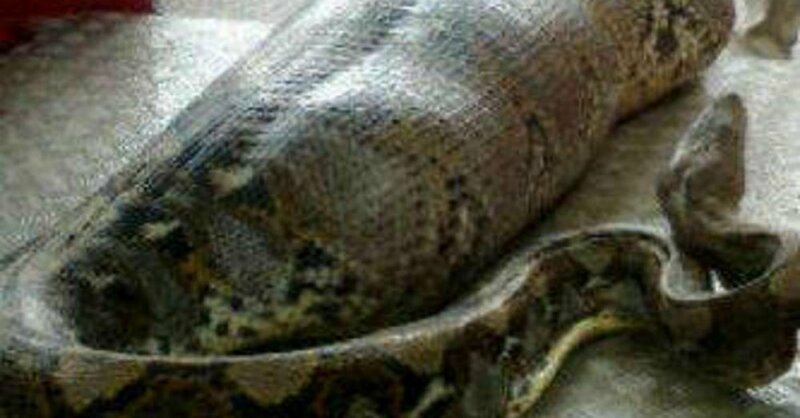 Its not the size of the object its the physical mechanic's involved that prevents the snake from consuming a human. The shape of the human head the positioning of the shoulders, the nessaccery repositioning of the snakes jaws once passing the head......These story's, vids, etc. are fake. So your "logical" deduction is that because one particular python, not even in the act of feeding, doesn't look to you like it could swallow one particular human, all incidents of any python eating any human, ever, must be fake. So some questions. 1. Don't different people have different body types? 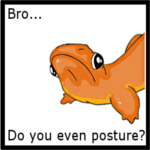 Not everyone is broad-shouldered. Especially this recent victim, a 54yo Indonesian village woman, may have had especially narrow shoulders. 2. Couldn't a narrow-shouldered woman also have her shoulders dislocated during constriction and become a smaller target? The clavicle stops short of the external end of the shoulders, the clavicle could be displaced (or as Kelly later points out, simply maneuvered into a different position if one arm is above the head), and in fact the clavicle is also one of the weakest and most easily broken large bones in the entire body. 3. How was the video faked? By whom? And how did they get the village elders, police, and scores of villagers involved to corroborate the story without anyone spilling the beans? I've spent the last 8 years in south/southeast Asia, and the crowds and setting and all reactions in both videos look incredibly authentic. They look ESPECIALLY authentic if you've ever seen the standard for acting in those areas. So how do you think it was faked? Give a step-by-step process. Also, consider that there are multiple different people filming and multiple videos of the incident were posted online. How do you think they managed that? I should add, the length of the videos and the amount of extraneous footage (the time milling about before they do anything and after the do it) is a good clue. If they were villagers who were just acting, would they do a full 8-minute scene without anyone in the group breaking character or overacting even once? 4. Is there anyone other than the great Ernie Eison who has seen the videos and can verify that they are faked? Who? What is their explanation. As I always have to mention, I have caught you in lies on this forum before, including lies involving things I had direct first-hand knowledge of. So I don't take your word for anything and don't believe anyone else should either. If you claim something is faked you have to prove it, not just assert it, working with the actual evidence (videos and witnesses and journalism) that has been presented. Otherwise your claims have no more credibility than you do. There is no doubt in my mind — zero — that this is totally authentic. I suspect that events like this transpire on Sulawesi and its adjacent islands (like Muna) every few years. Before everyone had video capabilities on their phones, these sorts of events went unreported in the media. I’ve seen polaroid photos of the exact same scenario playing out more than 15 years ago. This same discussion was had in the past, on another thread, and then there are all the other topics, turned into conspiracy-pieces by the same person. Hey if I visualize that same guy with his arm bent around his head swallowed at the elbow... Totally could see it happen. I mean really why the dedication to the contrary what is that some residual entrepreneurs code of commitment to a product? The rorschach all seems to make a python shape when the truth is even before the political drama and just at the tip of the internet info exchange, the Burmese python popularity was starting to dwindle. The babies were adorable but the adults were unwanted. Even the morphs couldnt change the simple math that there werent enough keepers for the adults to go around. We all have to take responsibility for our choices in life. Dont get it twisted - I know what species are involved - but the burms were your main thing, right? Its not ever going to happen again Ernie. And its not the activists or the dumb politicians fault. People dont want to spend their time caretaking things any more. Thats only one wee esoteric change thats come about with this 'internity'. Either that or you are trolling for interaction. A human being is no different than any other sack of meat. I still think about the neuroethology that would most often happen at initial human/giant snake contact, actions and postures and how they are perceived by a python on the ground, that these are the factors that prevent a predatory response and are responsible for its uncommonness. Not some rigid script of how I see a python not be able to get his head over a pair of shoulders. Something kinda interesting is presented in this thread. A huge percentage of people, mainstream people, probably always just believed a giant snake can eat a person. I would think some other subject matter would be the big fake of the century as one poster seems to think it is. We are the ones since we were kids that tried to tell people the truth about snakes. We are the debunkers. Its a hard habit to break I guess, but its good to be careful about what we think we know. But seeing is believing. I am talking first hand experience. When I was in my 20's I saw a red racer in the Mohave, that looked like it had swallowed a football. The snake was maybe 4 feet long, and at the middle (fattest point) it was bigger than my bicep muscle. We watched it for quite some time. It eventually crawled into a rock pile. We were pretty sure from the track evidence that it had eaten a Cottontail or Jack rabbit. Dang Craig like a warner bros cartoon what you describe yeah so many extreme examples, antlers and legs akimbo getting swallowed backwards, a feature like shoulders being an irrefutable dealbreaker isnt 'believable' to me. The videos look real to me, if i were to give an opinion i think i would be convinced even more if they [the ingested bodies] had spent a little more time in the snake as there are some tell tale digestive effects all of us who've ever pulled out a regur might find similiar. I would imagine minus the fur it would be like a giant half baked pinky. Clothes might be of relevance. Its fascinating forensically. Should I delete that? It was funny for a couple seconds and fellow boomer Craig just handed it over on a platter. I was just kidding but will delete on demand.